The house has had many owners and gone through several interior reorganizations, the last being the creation of four apartment rentals. In 1992 the house was saved officially and finally from becoming a parking lot, by the Martinsburg City Council. The Berkeley County Historical Society then purchased and restored the building and developed it into the Berkeley County Museum. Come inside the Belle Boyd House; on the right of the entry hall is the original ball room decorated in Victorian style as it would have been in the late 1800s. This is the only room in the house decorated as living quarters. Two black slate mantles (prepared as faux Belgian marble) decorate the twin fireplaces. Acanthus leaf brackets of white marble support the mantles; this was a common theme in Greek Revival style. ​Meetings, receptions, and seminars take place here. If your group is interested in utilizing our ball room space, please contact us. Through the door on the far side of the room step into the Ben Boyd store. This space was originally built by Benjamin Boyd in 1853 and housed the General Store that he ran for five years. Visit the second floor rooms including the master bedroom in the northeastern front of the house and what may have been Belle’s room across the hall in the front. Exhibits on Berkeley County history fill these rooms, some rotating and some permanent. Permanent spaces include a Costume Room, Black History, Industry, War & Military, County History and Toy Rooms. SEE EXHIBITS TAB FOR MORE INFORMATION ON EXHIBITS. The Berkeley County Museum is owned and operated by the Berkeley County Historical Society, a 501c3 non-profit organization. 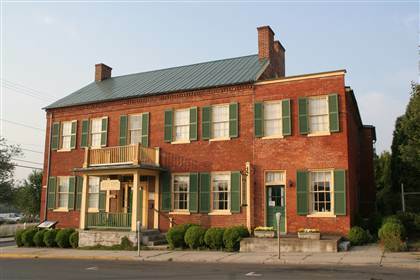 The museum is located in the historic Belle Boyd House located at 126 East Race Street in Martinsburg, West Virginia. In 1992 the Society, through the generous initial donations from Mr. Boyd H. Mason, saved the building from the wrecking ball. Many more donations, large and small, have been made since that time to continue what was begun nearly 30 years ago. Today the house stands as a timeless and effective reminder to county residents and the nation of Berkeley County history and heritage since the county’s inception in 1772.